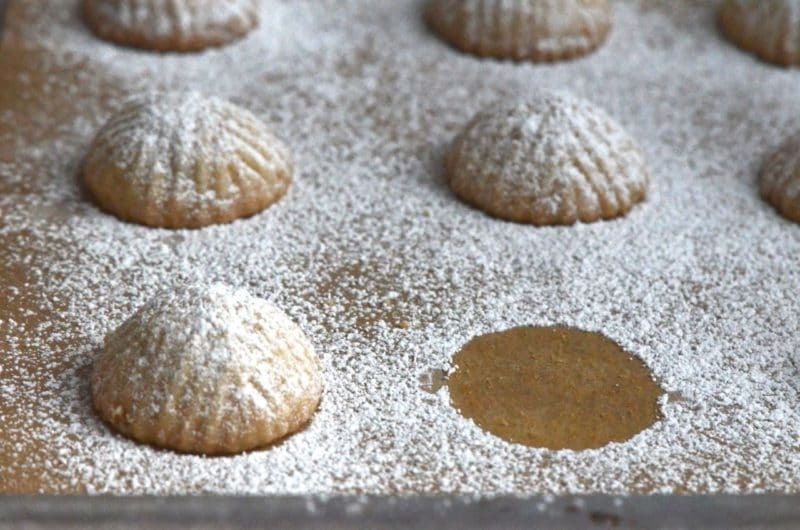 Ma’moul cookies are a beloved Lebanese tradition: fragrant butter cookies filled with walnuts, formed in a special mold. 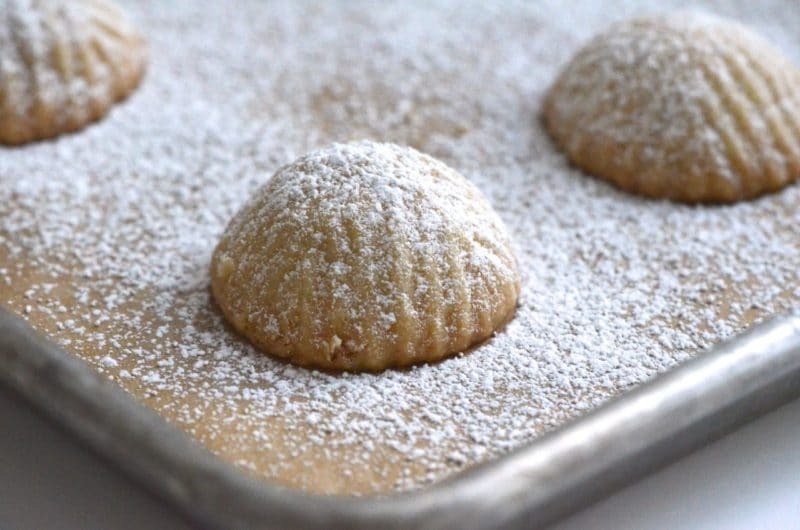 Ma’moul cookies are made in three classic shapes; the dome here is typically filled with a walnut-orange blossom mixture. I used to kick-box. A lot. And I loved to brag about it. Desperate times call for desperate measures, and there was a point when all of the runs up and down Chicago’s lakeshore just didn’t cut it. Seems I had plenty of pent-up punches to get out of me, and better the open air take the hits. Most of the time my inner kick-boxer is tame, but I know that she comes straight out of the Abood genetic cocktail. We are wired for action, and even more so for reaction. It’s a high blood pressure sort of a thing (but mine is low, at least for now; hurray for Mom’s genes), a high-intensity, stress-inclined personality that has its benefits and drawbacks. It’s an Abood hallmark (is that not true, cousins?). Aunt Hilda, like her siblings, did not escape the tumult either. I couldn’t help thinking about that when I was making my way through her and Sitto’s ma’moul recipes recently. Aunt Hilda always said she wasn’t a baker, yet she got after baklawa and ma’moul—beautifully molded, meltaway butter cookies stuffed with nuts or dates—like nobody’s business (not to mention her strawberry-whipped cream cake, one I’d kickbox my way to dip a fork into once again). Those aren’t exactly rookie pastries to master, and the ma’moul in particular takes some doing. 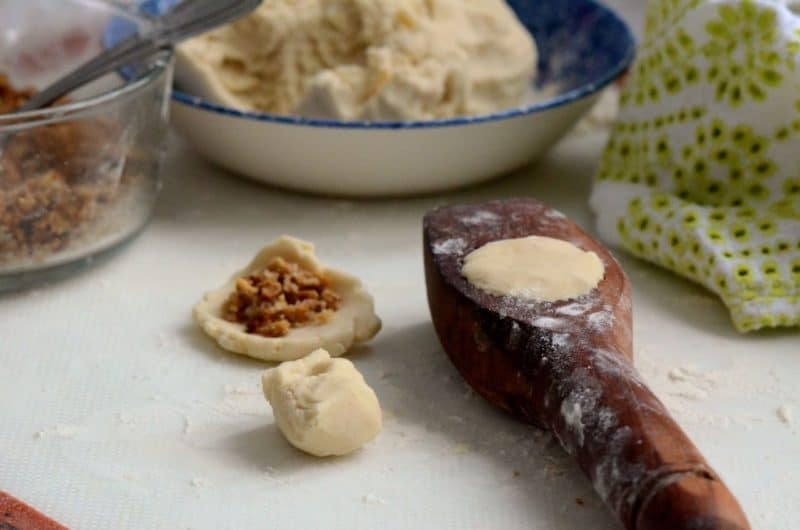 I’m surprised that the finer points of stuffing the heaven-soft ma’moul butter dough, shaping the cookies and then molding them in their special wooden forms held interest for Hilda, for not being a baker. But then perhaps the most crucial aspect of making ma’moul—releasing the cookies from the molds—was a real attraction: Dust the mold with flour, fill it with a nut-stuffed ball of dough to make the impression, then slam the mold face down against the (sturdy) table two or three times, until the cookie comes out. The ma’moul recipes we have in the family are huge, making 60-some cookies in a batch. My sense is that Hilda didn’t mind a bit the quantity, both for the beautifully wrapped trays she used to give along with her baklawi every Christmas, and, now I know, for all of the whacking she could get out of every big batch she made. I’ve been whacking away myself, wondering why I didn’t ma’moul my troubles away long ago. Clarify the butter using this method, or melt the butter over low heat, let it rest in the pot until the solids fall to the bottom, then strain through a fine strainer. Be sure to bring the butter to cool room temperature for this recipe. Find ma'moul molds at my online shop here; to clean them just rinse, without soap. Using a hand-held or stand mixer, beat the butter until it is light, fluffy, and holding peaks like whipped cream, about 6 minutes. Enjoy the beauty. Add the vanilla, orange blossom water, and 3 tablespoons of the sugar and beat for another couple of minutes. Sift in the flour and gently incorporate it into the butter with a wooden spoon. Add the milk, and then add more flour by the tablespoon until, as Sitto says, “the dough is ready to shape.” That means you should be able to make a ball that will flatten in your floured palm without melting into your hand or without cracking. Get your hands into the dough and knead it for a minute or two. Chill the dough for 30 minutes. Make the filling by processing the nuts until they are nearly-finely ground. Don’t take them too far or they will become paste. 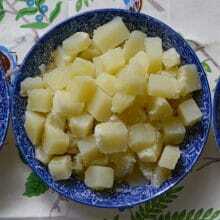 The nuts can also be finely chopped by hand. In a small bowl, combine the nuts with 3 tablespoons of sugar and 1 teaspoon orange blossom water, using your fingers to evenly distribute everything. Line two heavy baking sheets with parchment or Silpats. Pre-heat the oven to 325⁰F. To form the ma’moul, I like to press a bit of the dough in to grease the mold, then flour the ma’moul mold generously so that all grooves are coated. Pinch off about a tablespoon, walnut-sized piece of the chilled dough (larger or smaller depending on the size of your mold. A few tries will tell you how much to use). Flour the palm of your hand to prevent the dough from sticking, and flatten the dough in your palm to make a small (about 2-inch) round. 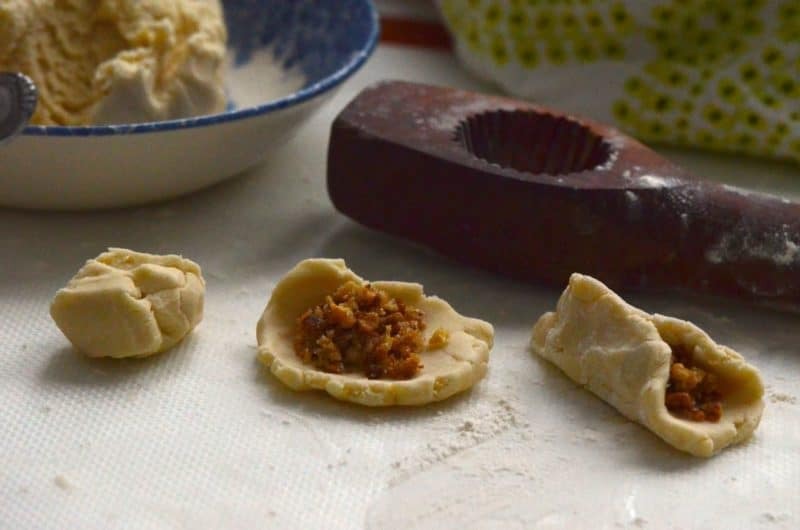 Place about a teaspoon of the walnut filling in the center of the dough, then fold it over like a crescent and seal the edges. Stretch the dough a little to get the dough over the nuts to seal. Gently nestle the stuffed dough, seam-side up (facing you), into the mold cavity. Using a light touch, press the dough into the mold—it doesn’t take much for the dough to assume the form of the mold. Flatten the exposed dough and wipe away any access with your fingers, making sure that the edge of the molded shape is clear of dough, for a defined cookie edge. You will get a feel for how much dough your mold takes, and how much filling you need, as you make a few of the cookies. Turn the mold over and slam it against the work surface until the cookie falls out. If you need to keep slamming to work out any stress in your life, have at it. Repeat this process with the remaining dough and cookies, moving the cookies to the sheet pans. If the dome of your cookies doesn't seem tall enough, plump them up by nudging the dough around the base of each cookie in a bit. Bake one pan of cookies at a time, until they are still mostly white but golden on the bottom. Check them by lifting one with a flat metal spatula after 15 minutes, and then again every minute or so for about 20 minutes, depending on the size of your cookies. Sift confectioner’s sugar over the cookies lightly while they are still warm, and then again when they are room temperature. Store them in an airtight container, where they will stay nice for at least one week. 45 Responses to "Lebanese Walnut Ma’moul Cookies"
Thanks to you, I now know the wooden tool I found in my recently-passed Gram’s kitchen (that I was sure was a strange looking juicer) is actually the mold for my favorite cookies! Can’t wait to make some using it to honor her memory. Merry Christmas! Thank you Maureen. They look delicious! 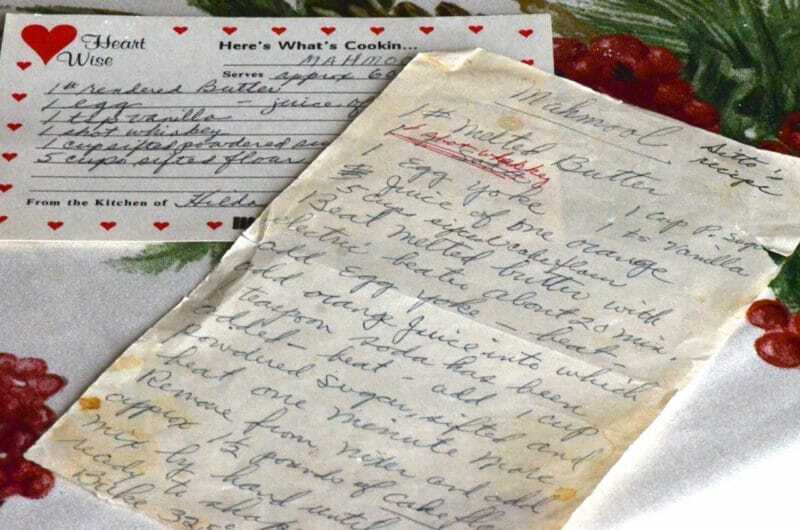 I love the beat-up recipe written out on paper. I’ve got lots of those. Tammy, how neat. I would love to try the Scandanavian molded cookies.Your grandmother was smart to bring the recipes!! A treasure. Thank you, as always, for your kind kind words! Hi Maureen. Really nice recipe, thank you! For those that do not have a cookie mold, my (Lebanese) grandmother made a similar cookie around Christmas every year, except they were called “half moon cookies” to us. She made them by flattening out a small disk of dough – maybe about palm-sized – placing the filling on one half of the disk and then folding the other half over and crimping down with a fork. You can see where the cookie name came from. Hope that helps a reader who may not have the required tool! My Lebanese grandmother did the same thing. She stuffed hers with chopped dates. I would be curious if anyone else had these cookies with dates instead of nuts. Might be a locale thing. Happy New Year to all! Have a Merry Christmas Maureen! You could at least give us those old family recipes. We could choose between the orange juice and the shot of whiskey.. I have purchased some new molds for the Ma ‘moul, but none are better than the one my mom used, the same one you show in the pictures! I am looking forward to my holidays to practice. I’ll try your recipe – I am sure it will be a success if I bake them right. I will only use “mahlab” instead of vanilla. Thank you very very much for your words. They are good for the soul and for the stomach. Jamila, thank you so much. The mahleb is very good in this! Hello. I’ve been roaming around here since yesterday. Nice stuff although I am familiar with the most as I am Lebanese living in an Arab country and of course visiting Lebanon few times a year. Having said that, I’ve never seen any of the ladies I know preparing Ma’moul this way. My mom, God mercy her soul.. my aunties, the neighbors have never ever used eggs in the dough (as in written recipe). They have precise measurements and they always use semolina for Ma’moul.. never flour. Looking at other recipes shared on this page.. I am sure this Ma’moul is another story. I guess I need to try to know. 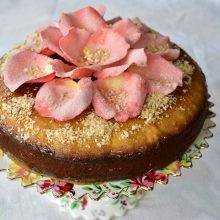 Hala, thanks so much—there are many traditional recipes for the semolina; my family and some of my old-school cookbooks use flour, which I hope you enjoy trying! Would these cookies freeze well if I needed to make several batches? Absolutely Jessica, in an airtight container, well wrapped for the freezer, these will freeze beautifully. You’ve become my go-to for recipes! Thank you for sharing your knowledge. My great aunt used the flat backside of the mold to flattened the dough ball but my grandmother rolled hers out. It’s possible to roll 2 or 3 at a time. Both placed the flattened dough over the mold before stuffing with the nut mixture. I measure the fillng with a plastic coffee scoop that came with a coffee pot. It’s slightly smaller than a regular scoop which is 1/8 cup. To avoid them getting stuck in the mold, I press the flattened dough onto a pastry board covered with sugar. Only need 1-2 wacks on the board & sugar doesn’t clog the design the way flour does. I made some with pecans using the shallow date mold so no one confuses them with the walnut one — they taste great. Great tip! I will try the ma’moul with sugar! Pecan also sounds delicious…thank you! 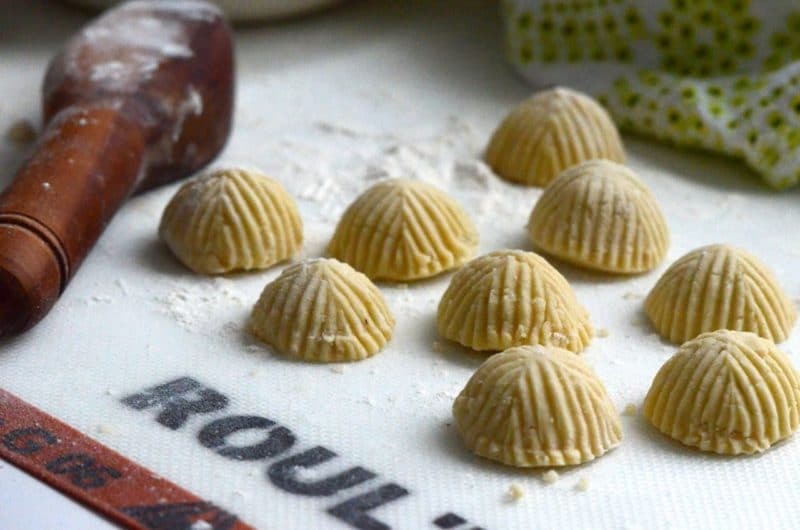 I’m so excited about making ma’moul mold cookies. Do you have any suggestions for sources for buying the molds? I didn’t have much luck with the links in your article about the cookies, probably because they are old links. Thanks. Teresa, thanks–I’m working on offering a great mold at Maureen Abood Market. Sorry for the links, will keep you posted! Thanks so much, Maureen! I would really like to try these cookies. My best friend, who is of Greek and Lebanese decent, and I make several pans of baklava together every Christmas for gift giving.. These cookies would be a great addition to that tradition. I’m so disappointed that I’m going to miss your presentations at Zingerman’s in May. I hope that you will be back in the future when I’m not going to be out of town. Thanks. I enjoyed reading about your maa’moul recipe. I just finished making two dozen date ones for an iftar function and they were a hit. I made mine with semolina and flour which turned out pretty good. Everyone was surprised that this old lady from Texas could make these. Great recipe! Do you know where they sell those wooden molds? 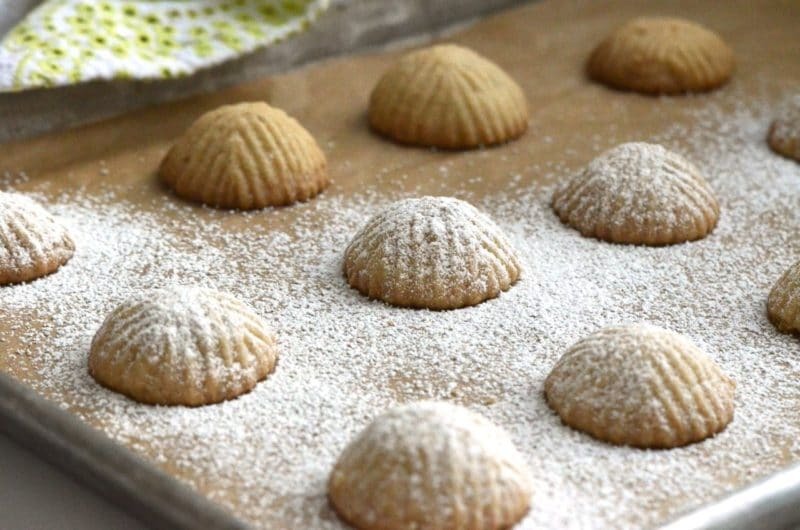 Id love to try and make these mamoul. Hope to have them soon at Maureen Abood Market! Stay tuned! Thank you for this recipe. I just finished making my Sitoo’s recipe. Her Mamoul were a farina based dough. This recipe is very much like the one she made and filled with ground dates with a little butter and shaped them like little footballs. I so enjoy your blog. It brings back so many wonderful childhood memories for me. Happy Holidays to you. I just got my mold and the recipe. Would you also share the version with whiskey and orange? Thanks so much! Thanks Nancy…I’ll keep you posted on this! My name is Hilda and I am Lebanese but I’m not your Aunt! However, I’ve been making these Maa’mul since I was a tyke, helping mom and aunt with them and later, my own. 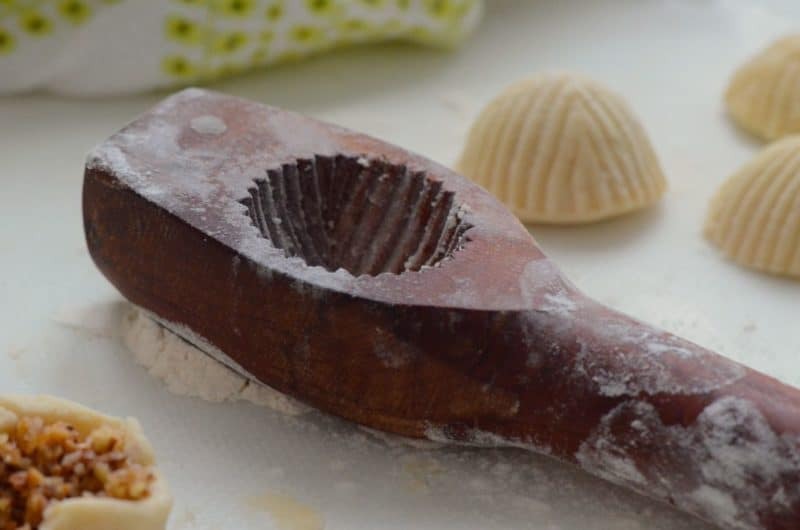 We never used molds; used a what the French calls pinceure (pincers in English), meaning to pince the dough and decorate it making all kinds of designs. Ma’amul decorated by hand are a treasure! Oh wow, yes, I’m sure the hand-decorated ones are so lovely. This is how we always decorated ka’ik, not with a mold. I made the cookies ….with dates (using cookbook recipe) just last week. Wanted to do a trial run before Easter. I actually did wonder about the sugar, but figured it out that the other 3 tablespoons were for the nut filling. I agree the oven temperature is too low, and time too short. I actually baked them again the 2nd day. They still looked a little ‘anemic’, so tried a couple of minutes under the broiler. That just browned the top. Maybe when I dust them with icing sugar that will work. Liked the taste and texture of the cookie, but did taste more like a ‘shortbread’ to me. Since I have not made the cookies before, I had nothing to compare with. Love orange blossom water and will likely increase it for next batch. 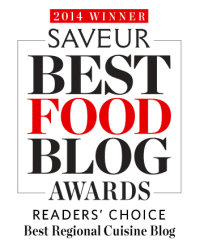 Love your videos and blog……..as well as cookbook. Many thanks. Great feedback Linda, and this really is more of a shortbread cookie flavor than some ma’mouls (there is a classic semolina flour version as well). Thank you!! i, too, love the stained handwritten recipes. so beautiful, lovely memory evoking treasures. The substitution of whiskey and juice of a real orange seems like a perfect combination for a holiday treat. Any chance you could supply that as another option in the Mo’moul recipe? Thanks Deena–keep an eye out for it, I’d love to share it down the line here! I just bought 2 molds, one for walnuts the other for dates and I’ll be trying my hand for the first time at both this year. Do the molds need to be seasoned at all before using them? Thanks for sharing your recipe, I’m looking forward to making these and hope that I don’t eat them all myself! Hi Lisa–good question. The mold should be well-floured for each cookie so they release, and once you make even one cookie the flour will stick nicely. I press some dough in and take it out to get new molds oily at the start. My mother always dipped the cookies in a simple syrup, while warm. They are so delicious! Everyone goes wild for these cookies. Just tried them with gluten free flour and they are still to die for! I add cinnamon to my walnut mixture. Yum. 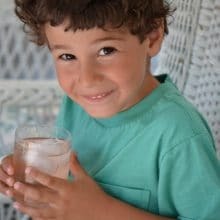 Thank you for your wonderful recipes! Hi Eva–thanks so much. That can certainly happen with the dough. I add the flour slowly so that I can be sure I don’t take the dough too far and make it dry. You can add milk very sparingly to get the dough back to a softer consistency if needed. If it’s too soft, add flour again very sparingly as these changes can affect the flavor and texture of the cookies. You might also clean the mold, then brush it with oil before shaping the cookies. Yikes I hit Send by accident and I wanted to ask: If the small round mold is traditionally has a walnut filling, what are the traditional fillings for the oval shape and the larger, flat circle shape? Hi! The oval is traditionally pistachio, and the flat circle, dates! Hi, was wondering if the butter can be replaced with oil or shortening? Hi Alisha–interesting question. I have not tried the ma’moul with those substitutes. I suspect shortening would work better than liquid oil, as often shortening is called for in butter cookies (or it used to be, according to my Betty Crocker cookbook! ).